We’re coming up on a three day stretch during which there are events related to play in Roslindale on each day. We hope to see many of you at one or more of these events. 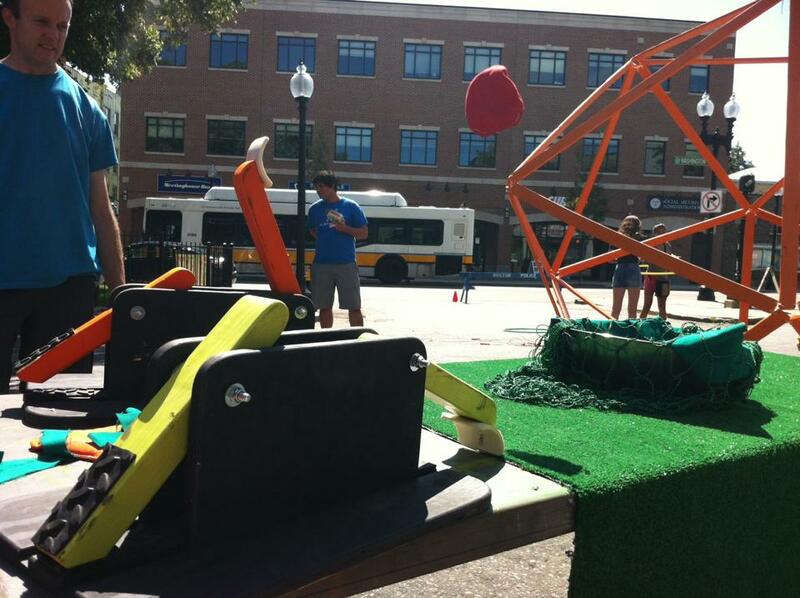 Roslindale Wants to Play is returning to the farmers market with games for kids of all ages. 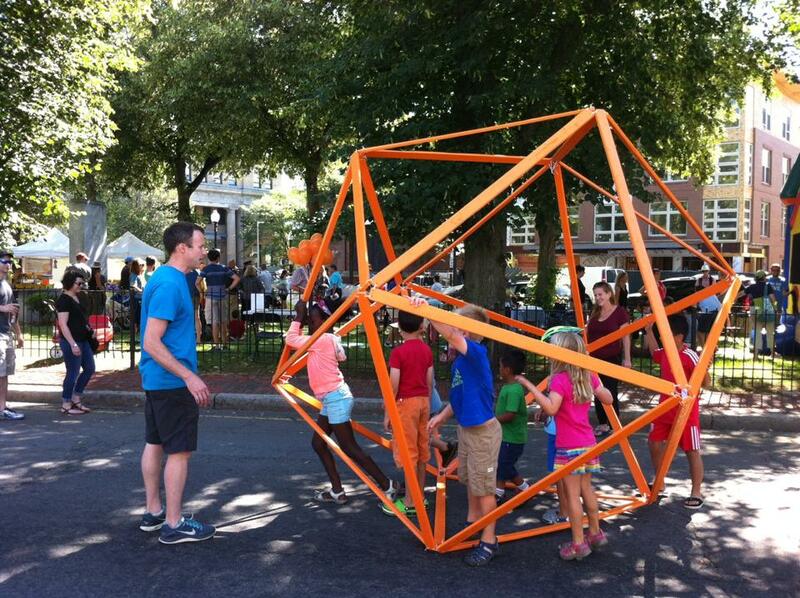 You may have seen us at the RVMS 30th anniversary celebration with a giant orange icosahedron and catapults that kids could use to launch bean bag vegetables into a salad bowl. We’ll be back on October 17th from 10-11 AM with more games and activities. Thanks to Roslindale resident Dave Hamilton, Creative Director at Explo, for allowing us to use the amazing contraptions he builds. 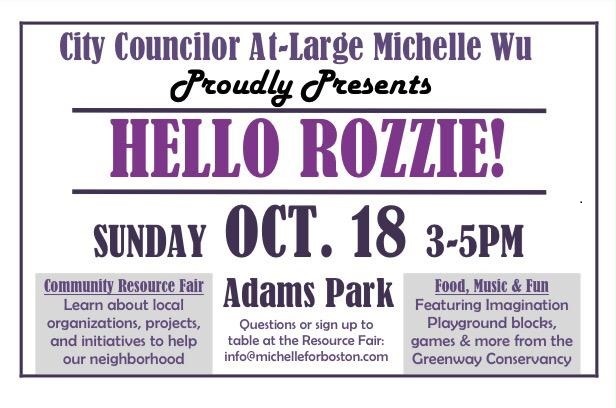 At-Large City Councilor Michelle Wu moved to Roslindale this summer and is hosting a party at Adams Park on October 18 from 3-5 PM to meet her new neighborhood. Councilor Wu has been attentive to open space initiatives around Roslindale, including Roslindale Wants to Play, and reached out to us for advice on how she might activate the park with play elements during the event. We are happy to see that she was able to borrow games from the Greenway Conservancy, including their Imagination Playground blocks. This is a great example of how Boston could share the resources enjoyed by our downtown parks among the city’s neighborhoods. After a fun weekend, bring your enthusiasm for play to a community meeting to discuss the upcoming renovations to the playground at Healy Field. The current playground is woefully inadequate given Healy Field’s potential to serve as a center of community play. The design process for the renovations at Fallon Field resulted in a design that we’ve heard nothing but great feedback about, and it’s terrific to have another opportunity to improve Roslindale’s play spaces. Community involvement will push the design team to create the best possible playground for the space, so please come and share your ideas! The meeting is on October 19 from 6:30-7:30, at the Roslindale Community Center.